A better day starts with a great routine. 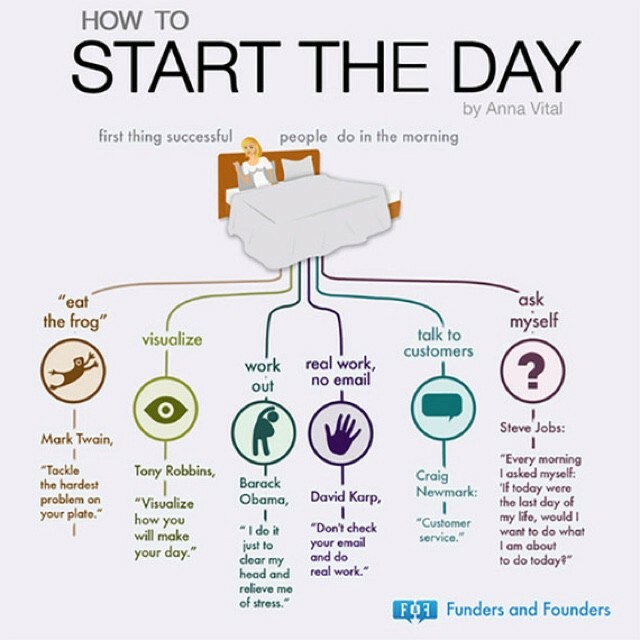 The Huffington Post published an article on morning rituals that help you create a better day, and ultimately a better life. The author places particular emphasis on the benefits of visualization, and how to take it to the next level by adding incantations. That’s right, not affirmations, but incantations. If you want to create real change in your life, affirmations alone aren’t enough. You can recite something uplifting, but if you aren’t embodying it physically, then you are only skimming the surface. That’s why incantations are so powerful. With incantations, not only are you speaking words of empowerment, you are using your body and your voice. You are changing your physiology and changing your state, and this can change everything. Using incantations to help take direct control of your state can make all the difference in your quality of life. Because the quality of your life is not necessarily based on the quality of your circumstances, it’s based on your mental and emotional filters that determine how you look at your life. This influences the stories we tell ourselves about who we are, what we’re capable of, or what’s achievable or not. The states we go into most often then become the most powerful filter of all that will determine whether we find the strategies necessary to succeed and whether we come up with a story that will empower us. So the question ultimately becomes, what is it that we can do to change our state of mind when we’re not able to maximize our true potential? One of the greatest scientific discoveries has been that you can alter your emotional mood by a radical shift in your “physiology,” and we can start to achieve that through incantations.